September always brings a new season for parliaments and governments in Europe, and today, we've got the annual Prinsjesdag celebrations in the Netherlands. As King Willem-Alexander addresses the representatives gathered in the Ridderzaal, we also get a bit of glitter from his queen consort. 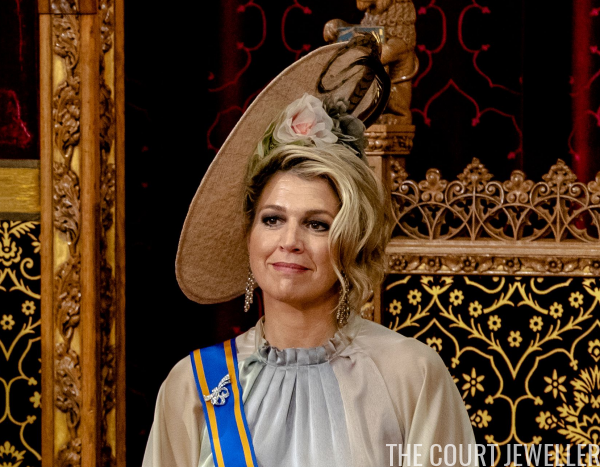 The dress code for Prinsjesdag is the fascinating daytime formal category, which means Queen Maxima always appears wearing a long gown, a daytime hat, and gala jewels and orders. 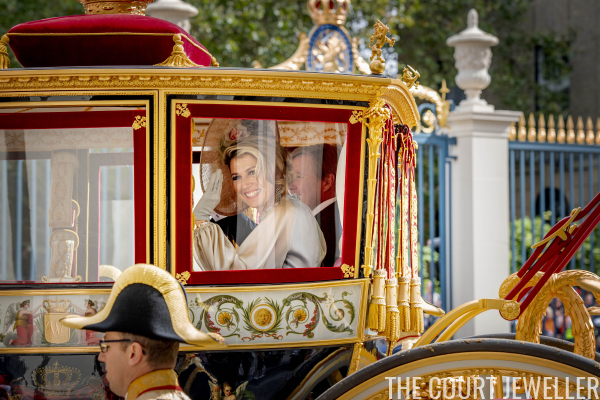 We got a good look at Maxima's long gown as she descended from the glass carriage that transports the king and queen on their traditional journey through The Hague from the Palace Noordeinde to the Ridderzaal. With her blush and blue ensemble, Maxima wore a pair of diamond fringe earrings. 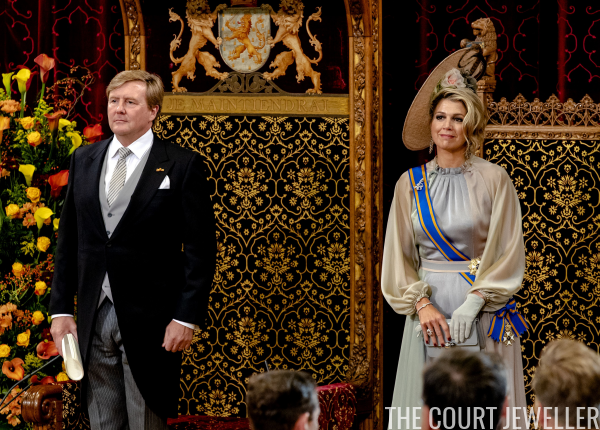 These dramatic earrings were notably worn previously for King Willem-Alexander's 50th birthday celebrations in April 2017, and we've got a great close-up available in our post on that event. 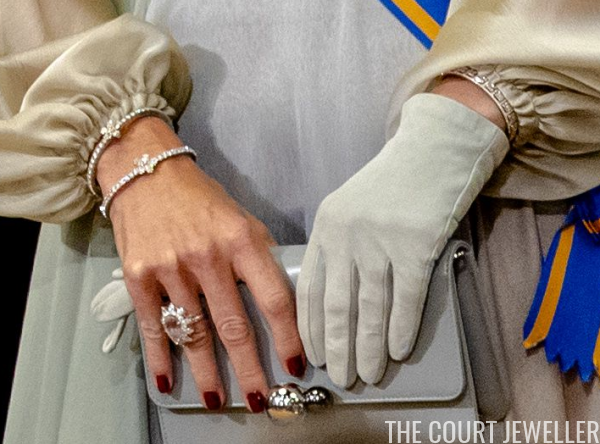 She added even more diamond sparkle with one of the family's ribbon brooches, using it to secure her order sash. 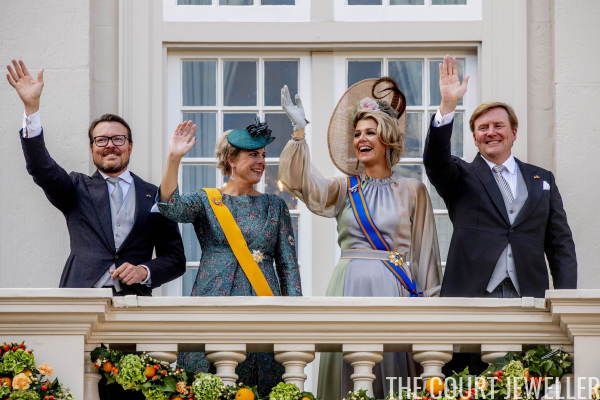 Back at the palace, Wax 'n Max were joined by Prince Constantijn and Princess Laurentien for the annual balcony appearance. 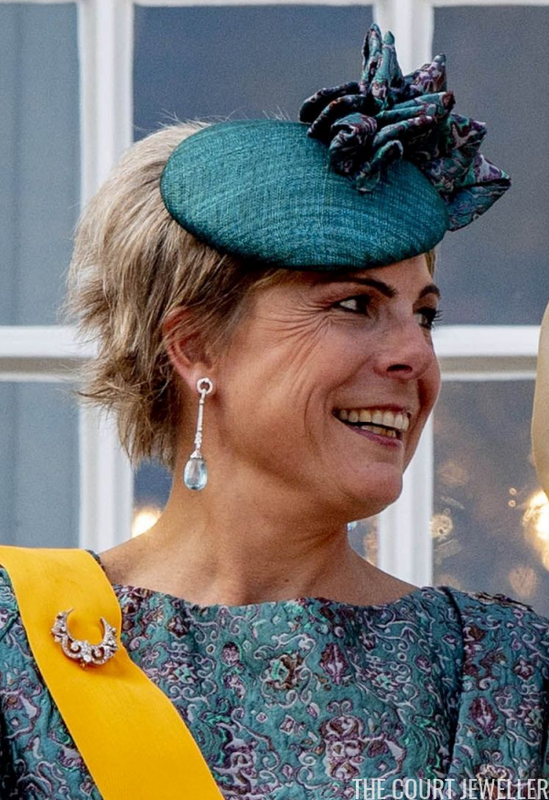 Laurentien also dipped into the family vaults for the occasion, wearing Queen Juliana's aquamarine earrings (also worn very recently by Queen Maxima) and the family's diamond crescent brooch. 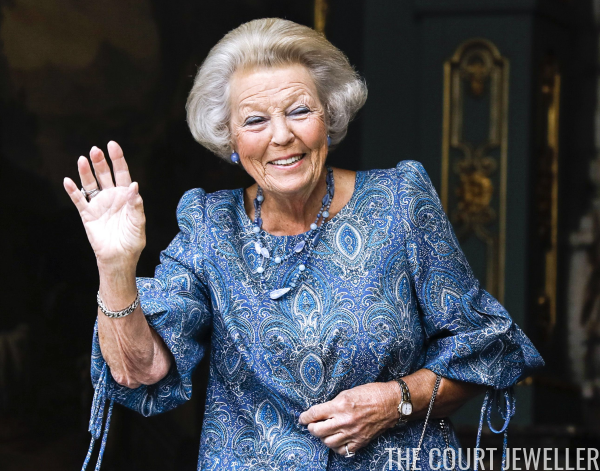 Princess Beatrix hasn't taken part in all of the pomp and circumstance of Prinsjesdag since her abdication, but she was still present in The Hague for the event, and she took a moment to acknowledge the people with a wave. Unlike her sons and daughters-in-law, she got to wear a more casual ensemble for the occasion, including a set of blue beaded jewels. And she wasn't the only family member present in The Hague. Queen Maxima's mother, Maria del Carmen Cerruti, and her brother, Juan Zorreguieta, were also at the Palace Noordeinde for the event. 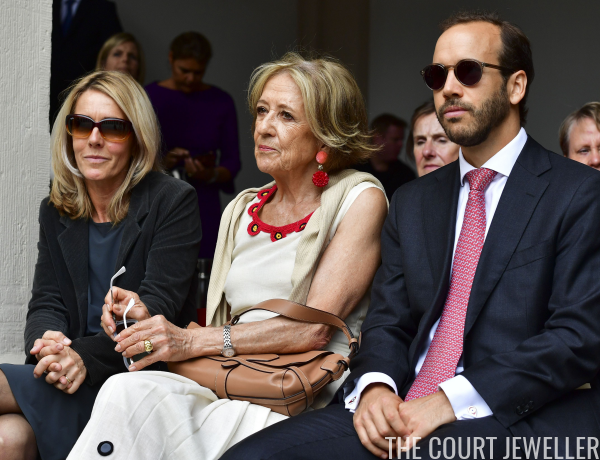 Here's a better view of the bright red statement earrings worn by Ms. Cerruti for the occasion -- a very Maxima-esque pair! It's been a tough year for Maxima's family, and it's lovely to see them welcomed in for a major event like Prinsjesdag.